Jason Kimelman-Block, Director of Bend The Arc: Jewish Action, joins Dan and Lex to discuss the ramifications of Donald Trump's presidency for American Jewish individuals, communities, and American society as a whole. The conversation explores questions as broad as "In what ways do politics and Judaism overlap?" and as specific as "What is the difference between a 501c3 and a 501c4 organization in terms of permissible political activity?" (13:35 - 30:42): To better understand the moment we are facing, Kimelman-Block outlines exactly what it is about Donald Trump and the group he terms "Trumpists" that is particularly disturbing and dangerous. He asserts that there is no distinction to be made between Republicans and Donald Trump at present. We delve into the ramifications of the Trump presidency on Jewish institutions and individual Jews,  in particular looking at the differences between 501c3 organizations (non-profits), which are most prevalent in Jewish life, and 501c4 organizations like Bend the Arc Jewish Action, which are not very common. Is it possible that the organization of Jewish life into the 501c3 system "domesticates" Judaism more than we can afford, or more than most Jews want, today? (30:43 - 47:53): Kimelman-Block broadens the conversation by speaking in general about the ways in which religion and politics overlap, especially when looking at the Jewish tradition. He also comments on the distinction between "classic" 20th-century Jewish institutions and newer organizations that may, in some cases, prove to be more relevant for our contemporary times. Learn more about Jason Kimelman-Block by reading his bio here, and explore Bend the Arc: Jewish Action's work by visiting their website. Kimelman-Block mentions Bend the Arc's "We've Seen This Before" statement being shared on MSNBC's The Rachel Maddow Show. Watch the footage from that November 2015 episode here. Learn more about the ongoing We've Seen This Before campaign by visiting Bend the Arc's website. To read a petition opposing Islamophobia that came out just days before this episode was released, click here. 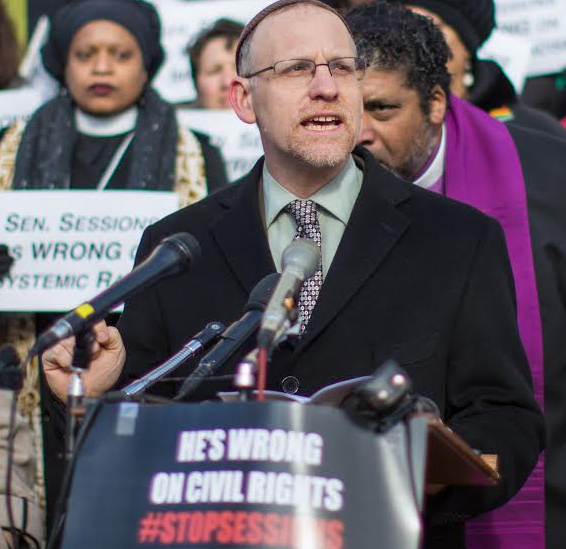 To learn more about the successful campaign, led by Jews United For Justice, for paid medical and family leave in Washington DC, which Kimelman-Block mentions, read this article, featured in Slate. Lila Corwin Berman provides a detailed overview of what Jewish 501c3 organizations can and cannot do in the realm of political advocacy in this article, featured on The Forward's website. To learn about Jewish involvement in the Women's March Against Trump, check out this article.